The hacks are fixed 12 feet behind each button; a hack gives the thrower something to push against when making the throw. On indoor rinks, there are usually two fixed hacks, rubber lined holes, one on each side of the centre line, with the inside edge no more than 3 inches (76 mm) from the centre line and the front edge on the hack line. A single moveable hack may also be used. The curling broom, or brush, is used to sweep the ice surface in the path of the stone, (see sweeping), and is also often used as a balancing aid during delivery of the stone.Prior to the 1950s, most curling brooms were made of corn strands and were similar to household brooms of the day. In 1958, Fern Marchessault of Montreal inverted the corn straw in the centre of the broom. This style of corn broom was referred to as the Blackjack. Artificial brooms made from man made fabrics, rather than corn, such as the Rink Rat, also became common later during this time period. Prior to the late sixties, Scottish curling brushes were used primarily by some of the Scots, as well as by recreational and elderly curlers as a substitute for corn brooms, since the technique was easier to learn. In the late sixties, competitive curlers from Calgary, such as John Mayer, Bruce Stewart, and, later, the world junior championship teams skipped by Paul Gowsell, proved that the curling brush could be just as (or more) effective without all the blisters common to corn broom use.During that time period, there was much debate in competitive curling circles as to which sweeping device was more effective brush or broom. Eventually, the brush won out with the majority of curlers making the switch to the less costly and more efficient brush. Today, brushes have replaced traditional corn brooms at every level of curling; it is rare now to see a curler using a corn broom on a regular basis. Curling shoes are similar to ordinary athletic shoes except that they have dissimilar soles; the slider shoe (usually known as a slider) is designed for the sliding foot and the gripper shoe (usually known as a gripper) for the hack foot.The slider is designed to slide and typically has a Teflon sole. It is worn by the thrower during delivery from the hack and by sweepers or the skip to glide down the ice when sweeping or otherwise traveling down the sheet quickly. Stainless steel was once common for slider soles, and red brick sliders with lateral blocks of PVC on the sole are also available. Most shoes have a full sole sliding surface, but some shoes have a sliding surface covering only the outline of the shoe and other enhancements with the full sole slider. Some shoes have small disc sliders covering the front and heel portions or only the front portion of the foot, which allow more flexibility in the sliding foot for curlers playing with tuck deliveries. When a player is not throwing, the players slider shoe can be temporarily rendered non slippery by using a slip on gripper. Ordinary athletic shoes may be converted to sliders by using a step on or slip on Teflon slider or by applying electrical or gaffer tape directly to the sole or over a piece of cardboard. This arrangement often suits casual or beginning players. After the stone is delivered, its trajectory is still influenced by the two sweepers under instruction from the skip. Sweeping is done for several reasons to reduce friction underneath the stone, to decrease the amount of curl, and to clean debris from the stones path. The stones curl more as they slow down, so sweeping early in travel tends to increase distance as well as straighten the path, and sweeping after sideways motion is established can increase the sideways distance. When sweeping, pressure and speed of the brush head are key in slightly increasing the layer of moisture that builds up under the stone.One of the basic technical aspects of curling is knowing when to sweep. When the ice in front of the stone is swept, a stone will usually travel both farther and straighter. In some situations, one of the two alterations in path is not desirable. For example, a stone may have too much weight, but require sweeping to prevent curling into a guard. The team must decide which is better getting by the guard but traveling too far, or hitting the guard. Much of the yelling that goes on during a curling game is the skip calling the line of the shot and the sweepers calling the weight. The skip evaluates the path of the stone and calls to the sweepers to sweep as necessary to maintain the intended track. The sweepers themselves are responsible for judging the weight of the stone, ensuring the length of travel is correct and communicating the weight of the stone back to the skip. Some teams use stopwatch timing, from back line to the nearest hog line as a sweeping aid. Many teams use the Number System to communicate in which of 10 playable zones it is estimated the stone will stop.Usually, the two sweepers will be on opposite sides of the stones path, although depending on which side the sweepers strengths lie this may not always be the case. Speed and pressure are vital to sweeping. In gripping the broom, one hand should be one third of the way from the top (non brush end) of the handle while the other hand should be one third of the way from the head of the broom. The angle of the broom to the ice should be so that the most force possible can be exerted on the ice. The precise amount of pressure may vary from relatively light brushing (just cleaning to ensure debris will not alter the stones path) to maximum pressure scrubbing. 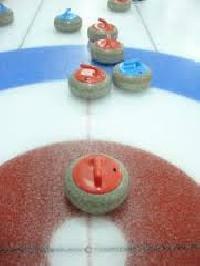 Sweeping is allowed anywhere on the ice up to the tee line, as long as it is only for ones own team stones. Once the leading edge of a team stone crosses the tee line only one player may sweep it. Additionally, when a stone crosses the tee line, one player from the other team is allowed to sweep it. This is the only case that a stone may be swept by an opposing team member. In international rules, this player must be the skip; or if the skip is throwing, then the sweeping player must be the third. Occasionally, players may accidentally touch a stone with their broom or a body part. This is often referred to as burning a stone. Players touching a stone in such a manner are expected to call their own infraction as a matter of good sportsmanship. Touching a stationary stone when no stones are in motion (there is no delivery in progress) is not an infraction (unless the stationary stone is struck in such a manner that its position is altered), and is a common way for the skip to indicate a stone that is to be taken out.When a stone is touched when stones are in play, the remedies vary between placing the stones as they end up after the touch, replacing the stones as they would have been if no stone were touched, or removal of the touched stone from play. In non officiated league play, the skip of the non offending team has the final say on where the stones are placed after the infraction. Guards are thrown in front of the house in the free guard zone, usually to protect the shot rock (the stone closest to the button at the time) or to make the opposing teams shot difficult. Guard shots include the centre guard, on the centreline and the corner guards to the left or right sides of the centre line. See Free Guard Zone below. are thrown only to reach the house. Draw shots include raise and angle raise, come around, and freeze shots. Takeouts are intended to remove stones from play and include the peel, hit and roll and double shots.For a more complete listing, see Glossary of curling terms. Last rock or last stone advantage in an end is called the hammer. 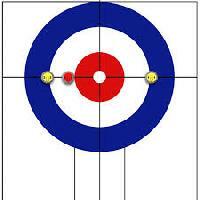 Before the game, teams typically decide who gets the hammer in the first end either by chance (such as a coin toss), by a draw to the button contest, where a representative of each team shoots a single stone to see who gets closer to the centre of the rings, or, particularly in tournament settings like the Winter Olympics, by a comparison of each teams win loss record. In all subsequent ends, the hammer belongs to the team that did not score in the preceding end. In the event that neither team scores, the hammer remains with the same team. Naturally, it is easier to score points with the hammer than without; in tournament play, the team with the hammer generally tries to score two or more points. If only one point is possible, the skip will often try to avoid scoring at all in order to retain the hammer until the next end, when two or more points may lie. This is called a blank end. Scoring without the hammer is commonly referred to as stealing, or a steal, and is much more difficult.